1 Best gun safes 2019 – Detailed review! 3 Why is a gun safe important? 4 What to keep in mind while buying a gun safe? If you own a gun, keeping your trusted equipment safe from damage should be your priority. The elements can damage your gun and cause heavy depreciation if you fail to do so. It is old fashioned to leave your guns hanging on the wall to show off. Now, you need highly functional gun safes that not just look good but also provide state-of-the-art gun security to the users. Best gun safes 2019 – Detailed review! A powerful and dependable option, then the Liberty Fatboy series should be your first choice. These gun safes are known for their exceptionally durable build quality as well as their spacious interiors. The Fatboy can hold 64 guns at a time- it has two collector racks that can house 32 guns each. For lesser guns, you can go for Fatboy Jr. who holds 48 guns. No matter what you decide, you will get enough space to hold your accessories as well as valuables. You can choose between a mechanical or digital combination lock. It also comes with a variety of accessories which provides pistol storage. However, it is best used for long guns. If you are looking to save up to 12 rifles in a strong and durable safe, then look no further than the Barska Large Biometric Rifle Safe. This high-end safe can remember 120 fingerprints and locks with a biometric and a five-deadbolt locking system. It also comes with cushioned interiors that keep your guns in top shape without any scratches. The 57-inch tall case must be mounted to a cement foundation and can hold some ammunition along with a small handgun. If you are looking for several compartments and extra storage, then you will find this Amsec BF720 gun safe to be the right fit. While the safe is very bulky, it provides numerous different options for storing everything from pistols to rifles and from ammunition to valuables. The safe is made of heavy steel, and ½-inch steel plated door backed by 1-inch DryLight insulation that provides adequate fire protection. It can handle temperatures up to 1,275 degrees Fahrenheit for up to 90 minutes and has dual fire silicone seals on the door jamb that keeps your stored goods safe. It has a strong thick bolts clamp shut system, and the steel is pry and drill proof. The interior comes with a soft fabric lining to avoid scratches. The Paragon Lock & Safe comes with 18-gauge powder coating providing additional security. It comes with hidden hinges that provide added theft protection and prevent drilling as well. The safe can fit eight long guns and comes with a matted bottom for extra cushioning. The safe isn’t designed to help you store valuable- it focuses mostly on adequate rifle storage. The 55-inch tall safe can hold a pistol, ammunition and some valuables in a small lockbox. The safe comes with a simple yet safe design which will attract no-nonsense buyers. Not all gun safes are designed to handle big rifles- some are specifically made to handle your pistols. The Gunvault Speedvault SV500 Gun Safe provides you quick access and secure storage for firearms. 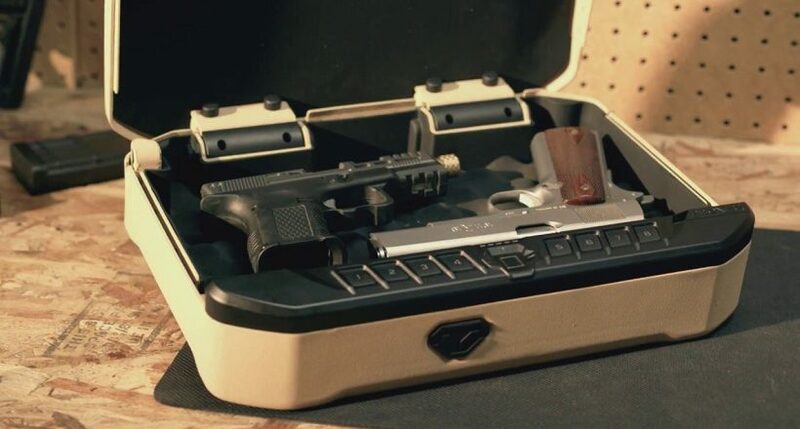 The drop-down drawer design of the safe keeps your gun secured and protected while its compact design ensures that you get to access your firearms quickly, from under the desks and chairs as well. You can mount the safe on a number of surfaces. It comes with an interior light which makes it easy to use in low-light conditions. The keypad also has a silent mode, so intruders won’t know when you are releasing your pistol. It is made of 18-gauge steel for added durability. Gunbox 2.0 is an ideal gun safe for pistol owners who want to avoid any health hazards and want good-looking equipment too. This safe can store a handgun anywhere in your house and comes with a tight lock that can be opened with RFID keycards or RFID key fobs. This makes it a highly secure offering. You can also unlock it via a fingerprint scanner and even by Bluetooth using the Gunbox smartphone app. It runs on a Li-ion battery that lasts up to one year in a single charge. A sensor alarm goes off when the unit is moved, making it more secure. This drilling, hacking and prying safe Bighorn 19ECB Gun Safe is designed to provide you high-end protection with its 1.5-inch thick 12-gauge steel. It comes with sturdy 1-inch door bolts that provide you extensive protection coupled with its advanced combination lock. The safe comes with shelving to store long guns as well as smaller firearms and even jewelry and other valuables. The product can withstand 1,200 degrees Fahrenheit of heat for up to 30 minutes. Your valuables and guns will remain safe in case of a fire. The 58-inch tall safe can easily fit up to 20 rifles at once and stores pistoles on four shelves and compartments. The Steelwater Standard Duty 16 Safe can easily store 8 to 10-inch-long guns and comes with an additional storage option for handling smaller rifles. It has compartments built into the 4-inch thick door, which is both ballistic and drill proof. It has ten 1.5-inch steel locking bolts providing maximum security for your guns as well as valuables. It can resist heat up to 1,875 degrees Fahrenheit for one hour, protecting your safe from fire damage. It comes with an EMP proof electronic combination lock, coupled with a bypass key. The safe also comes with built-in LED light for better access. If you are looking for a secure handgun safe, look no further than the Fort Knox FTK-PB. This 20-pound handgun safe comes with 10-gauge steel thickness and is boltable as well. It comes with the mechanical Simplex lock system that you could even open in the dark. If you stack them right, the safe will easily be able to hold 2 to 3 pistols and some mags. Though it is a strong build, it features only 1081 combinations. This is not a small number but doesn’t provide top-of-the-line security either. The Winchester Pony 19 Gun Safe is a mid-sized safe for people who have a small collection and don’t want a bulky safe in their homes. The safe is RSC rated and is available in electronic format as well. It uses strong 12-gauge steel for added security and protection of your guns. The interior is designed for storing long guns, handguns, and even magazines, documents and jewelry. The 60-inch tall safe can withstand heat and fire for 60 minutes even at scorching temperatures of 1400 degrees Fahrenheit. If you own a gun, you should own a gun safe as well. First, these safes help in protecting your firearms from damage. 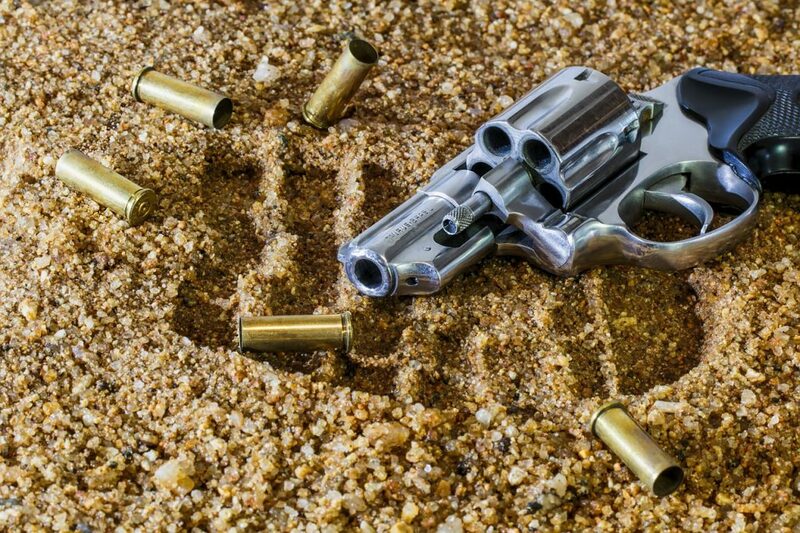 Over the years, a gun kept in a chest of drawers will eventually be damaged due to dust. The depreciating firearm is often of no use to the owner. Keeping it in a dedicated safe will help you keep them in pristine working condition for longer. It will also prevent theft of your guns. As the number of gun-related violence is increasing, you don’t want your gun to be stolen and used in an unfortunate incident. Finally, you need to keep your children, family members and visitors safe from the gun. 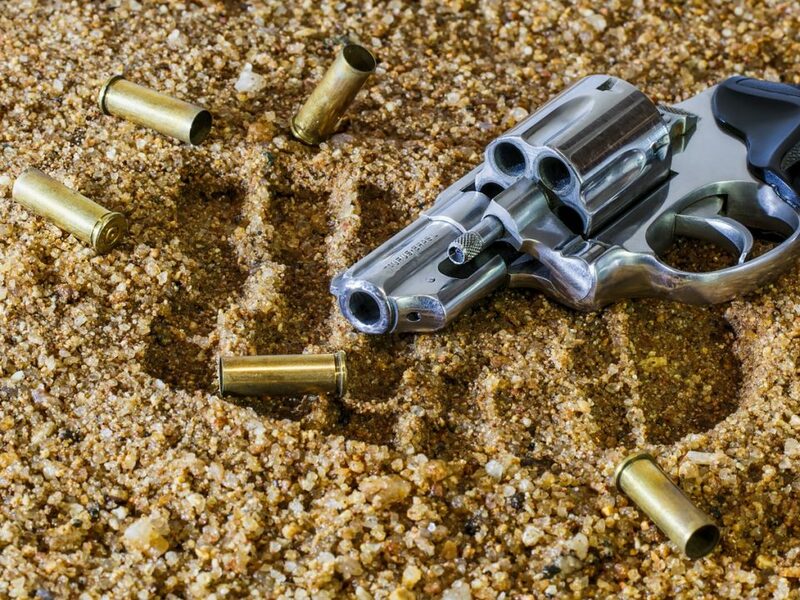 Instances of guns firing accidentally and damaging property or hurting people are not uncommon. A crafty teenager or curious child in your house with access to your gun could wreak havoc and even harm themselves. Locking your guns away in a safe space is ideal in these circumstances. What to keep in mind while buying a gun safe? The second thing to notice is the feature-richness of the safe. This is an entirely subjective matter. Some people prefer to keep their gun safes simple with a strong digital combination lock with backup keys. Other people like to buy more feature rich options like LED lights, smartphone support and more. These features simply work as add-ons. You can decide whether you want or not? Finally, you have to think about the cost of the safe. Always buy something that fits in your budget and makes sure that you never stretch too far beyond your budget. Thicker steel, extra features, and higher fire resistance are some features that will always come at a premium. Make sure that you make adjustments. You must always ensure that you buy a gun safe that provides you the maximum value, fulfills most of your needs and gives you ample protection over the long run. You must always do thorough research before buying a product and read expert as well as user reviews before making a purchase. 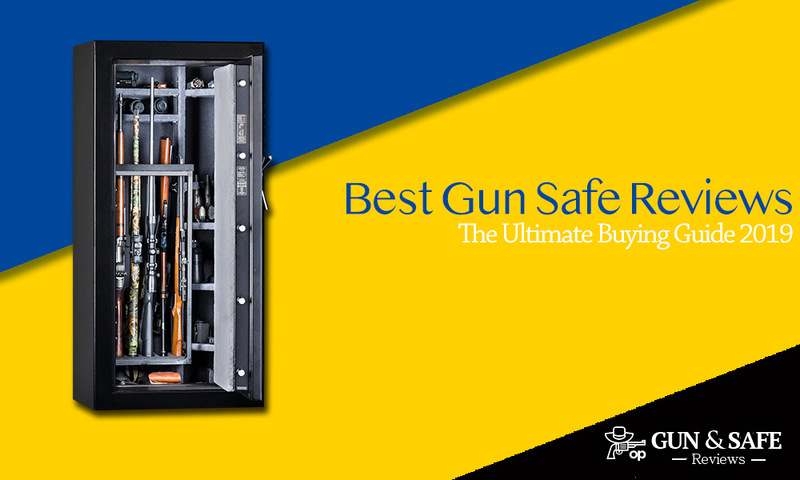 After reviewing 25 gun safes, our top experts came up with these gun safes as the best safes for the year 2019 with providing the detailed review on why we should buy it and what are the features that may amaze you. Considering price as the primary feature the reviewed gun safes are for an affordable price(s).